There are many versions of Polish poppy seed cakes and many of them use yeast pastry. This one does not have a yeast based pastry and is much easier to make as it does not take as much time as the more traditional roll. I often make this one now for Wigilia – Christmas Eve. The original recipe used twice this amount but I often found it would sink in the middle which did not look as nice so now I always make this smaller one. This version has a lemon glaze followed by lemon icing – this is my favourite but you could just dust the cooled cake with icing sugar or use the glaze then dust with icing sugar before serving. I find this easer to remove using either a loose bottom or spring form tin – Grease a 20cm diameter tin. 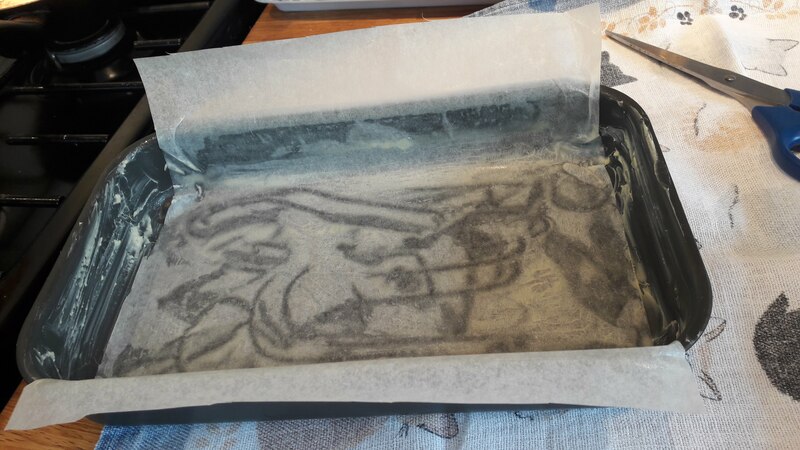 grease and line with one piece of greasproof for the 2 long sides and base -so you can remove the cake from the tin easily – a 16 x 27 cm tin. Whisk the egg, sugar and vanilla extract until they are thick and creamy. Stir in the poppy seeds and lemon rind. Sift the flour and add the baking powder and salt. Fold this into the egg and poppy seed mixture alternating with the milk – do this in about three batches. Fold in the melted butter and the oil. Pour the mixture into the tin and bake for around 30 to 35 minutes. Leave to cool for about 5 minutes and release the cake from the tin and put on a cooling rack or remove using the 2 ends of the greaseproof. Mix the lemon juice and caster sugar to dissolve the sugar, dribble this over the cake so the top in covered. Leave till nearly cool then put the cake on a plate or stand. Pour this over the cake. You can aim for just the top covered or to have drips down the sides.